A new Intel desktop roadmap published by the Chinese-language edition of VR Zone reveals that Intel plans to release both Broadwell and Skylake in the second quarter of 2015. 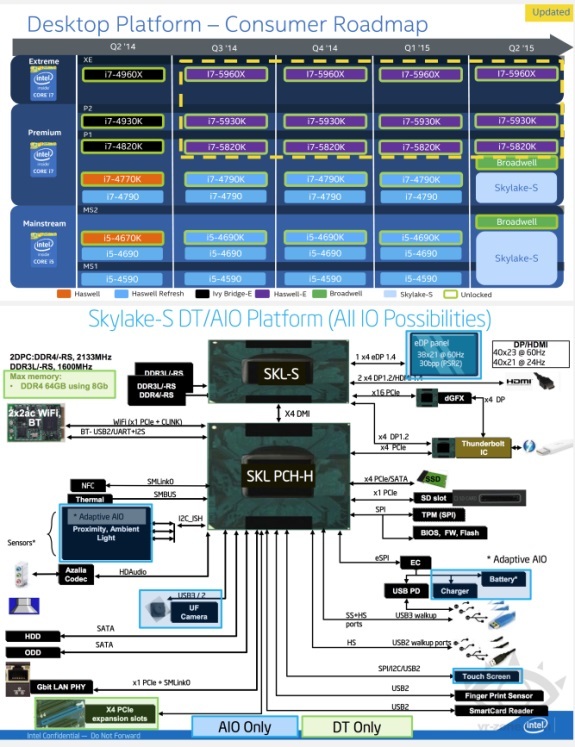 The fact that both platforms will be launched at the same time is quite remarkable, Broadwell is a 14nm shrink of Haswell while Skylake is a new 14nm architecture with support for DDR4 memory. Skylake will use the new LGA1151 socket and is expected to feature big integrated graphics enhancements. Both processor series will target the premium and mainstream markets but one of the key differences is that Broadwell will feature unlocked multipliers. Overclockable Skylake processors are reportedly pushed back to a release somewhere in 2016. Tablet and laptop versions of the Broadwell CPU will arrive a bit earlier, they are expected by the end of 2014 or early 2015.